Male: Carapace length 9.22 - 12.30 mm. Female: Carapace length 9.69 - 13.89 mm. Large atracine spider. Body length of males ( excluding jaws or chelicerae ) about 25 mm and females about 35 mm. Glossy dark brown to black on the carapace and brown to black, often with a plum tinge, on the dorsolateral abdomen. Open coastal forest, tall open forest ( remnant closed forest ) and upland forest. Terrestrial predator. Tends to construct its retreat on the ground beneath rocks and fallen timber, often on gully slopes with moist soil. The white silk tube is long, sometimes up to 0.6 metres with a Y- or T-shaped entrance offerring two points of entry or exit and braced with many struts to hold it in position. Feeds mainly on insects, their larvae, snails, millipedes, skinks frogs or any other small creature wandering near the retreat entrance. 0.14 mg ( dry weight ), Sutherland and Tibballs (2001) ( Ref : R001112 ). General: Untreated Lethality Rate: Most cases minor, but in severe cases, high lethality rate if untreated. Headache, nausea, vomiting, abdominal pain, coma, rarely convulsions. 1. If the spider is still attached, immediately remove it, being careful not to sustain further bites, and place to spider in a jam jar or other container, so it may be brought to the hospital for identification. 2. After ensuring the patient and onlookers are no longer at risk of further bites by the spider, the bitten person should be reassured and persuaded to lie down and remain still. Many will be terrified, fearing sudden death and, in this mood, they may behave irrationally or even hysterically. The basis for reassurance is the fact that many bites do not result in envenoming, and the effectiveness of modern medical treatment. 3. The bite wound should not be tampered with in any way. 5. If there is any impairment of vital functions, such as problems with respiration, airway, circulation, heart function, these must be supported as a priority. In particular, both airway and respiration may be impaired, requiring urgent and prolonged treatment, which may include the mouth to mask (mouth to mouth) technique of expired air transfer. Seek urgent medical attention. 8. If the offending spider has been killed or caught it should be brought with the patient for identification. 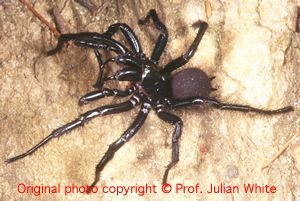 Many relatively harmless spiders may appear similar to the funnel web spiders and there are several species of funnel web spiders, so identification of the spider is important. 9. The spider bite victim should be transported as quickly and as passively as possible to the nearest place where they can be seen by a medically-trained person (health station, dispensary, clinic or hospital). The bitten limb must not be exercised as muscular contraction will promote systemic absorption of venom. If no motor vehicle or boat is available, the patient can be carried on a stretcher or hurdle, on the pillion or crossbar of a bicycle or on someone's back. 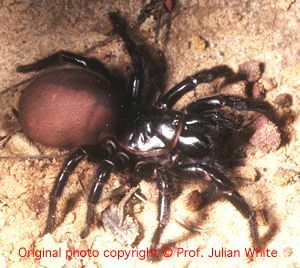 Funnel web spider bites, though mostly minor, can cause severe, even fatal envenoming rapidly, so all cases should be managed as a medical emergency. 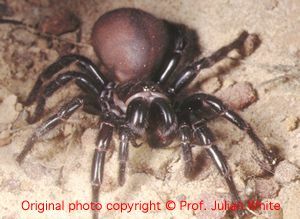 At the first sign of systemic envenoming, IV CSL Funnel Web Spider Antivenom should be given, 2-4 vials initially, depending on severity, followed by further doses if envenoming persists or recurs. Painful bite, rapid development of systemic envenoming, with perioral tingling, tongue fasciculation, headache, nausea, increased sweating, salivation, lachrymation, piloerection, hypertension, pulmonary oedema.